With winter being the one to leave out. The above chart shows the current year's weekly rainfall against the backdrop of the long-term weekly average (dotted line) and median (solid line) rainfall. The median (solid line) shows the meteorologic wet and dry season very clearly. From Columbus to Memorial Day, the long-term daily median rainfall amount drops to zero. Or in other words, don't expect rain for that half year span. Compare that to the summer when we can be all but assured that somewhere in south Florida on any given day its raining. There is a side of me that couldn't agree more. As you can see clearly on the chart above, south Florida has three distinct seasons: (1) the high rainfall and high ET season (June to October), (2) the low rainfall and low ET season (November to February) and (3) the low rainfall and high ET season (March to May). (2) a winter dry season. The above chart shows the relation of south Florida's two meteorologic seasons, i.e. wet and dry, with the landscape hydrology of the swamp. 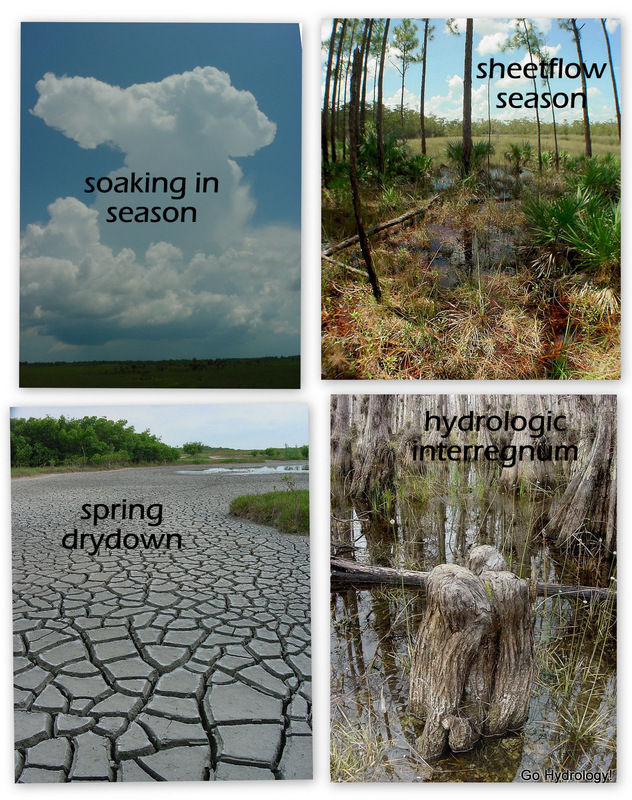 The typical duration of flooding in major swamp habitats is also shown. Soaking in season The early part of May is usually the crunchiest time of the year to walk through the swamp: water is absent except in its deepest pools, but by month’s end the wet season will have started, followed by June – the rainiest month of the year; yet only rarely do waters peak this early, thus making it a “soaking in” season during most years. Sheetflow season. The onset of summer, lasting into early Fall, coincides with an extensive but ephemeral sheet of shallow and flowing in the swamp. It’s flowing aspect is achieved when waters rise to the base of the hydric (i.e., a depth of 20 inches in the pond apple swamps) pinelands and higher. The depth, spatial extent and flow rate of sheetflow typically peak between late August and early October. Hydrologic Interregnum. Starting with the demise of sheetflow in mid fall and lasting through winter is the hydrologic interregnum. This is an approximate 5 month period in which water is still present on the ground, but no longer flowing and slowly receding from the landscape. In this way it defines the lag between the end of the meteorologic wet season and subsequent terrestrial drying, which is habitat dependent. March makes its end with drying the tall cypress, leaving water only in isolated pond apple forest, marshes, and refugia pools. Spring drought. Mid March and most of May mark the driest part of the dry season. The final third of the meteorologic dry season is punctuated by increased evapotranspiration, often accelerating the decline of water table and desiccating the surface, increasing susceptibility to wildfires. Not your typical "four season,"
(2) South Florida has anywhere between 2 and 4 seasons. (3) We are on the brink of entering "soaking in" season.